How long do the batteries last if left "on" 24/7? BEST ANSWER: I have this camera placed outside in the frigid cold and I would guess the batteries last about 1 month at most. In the warmer summer months I can get about 2.5 months of battery usage from it. Not long, in the cold weather mIne only lasted about 2-3 months. What are the dimensions of the dome area? I am so happy with these fake cameras. They look so real, that I have to remind myself that they are fake. I have real video cams at the crucial locations around my house, but got a couple of these to add a deterrence factor to other areas. I think the dome style is good for this, since the bad guys have no idea where the supposed lens in pointing. There are also no external parts (flimsy looking brackets, wires) that can come loose or detach, or identify it as a dummy, like there is for bullet-style dummy cams. Dummies see it as real. After easy installlation, the product performed as described. Who is the Dummy Camera Now ? Realistic looking cameras. one of the four i ordered the base attachment was broken on. I wrote and told them about but they wanted me to take pictures and send in claim....... not worth it for a $9 camera. I'll just do without. CONS: base attachment is made of very thin plastic. If they are broke when you get them be prepared to either go without or order another. I really fooled everyone, I had them wave to the camera and I acted so proud of how I installed the security system myself, they all really fell for it, some telling me" I want to do this to my home, and nice job that's a really good idea." 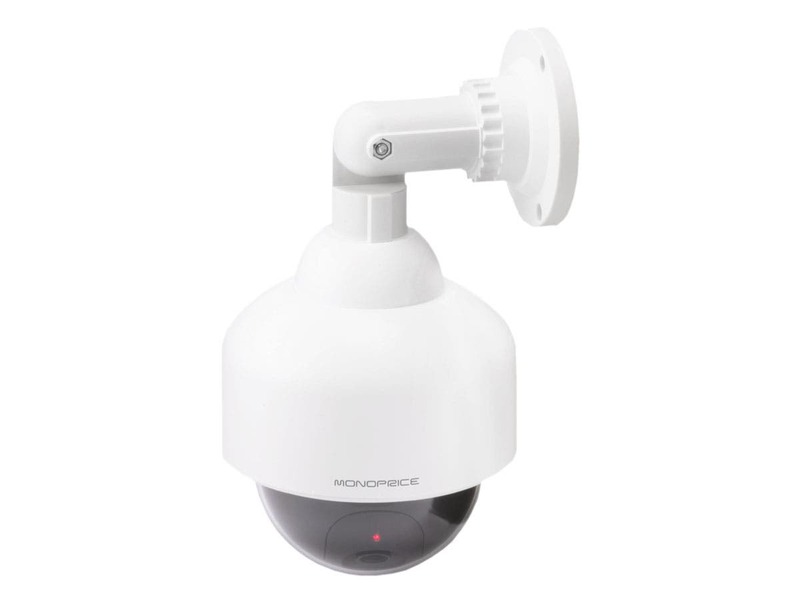 My problem is, "Monoprice" is written on the camera. I guess I didn't think it was that big of a deal from the picts on this site, but I think it is kinda weird to see this name on the camera, why would this fool anyone, but mine did. If you get these, buy a magic eraser which will take off the word monoprice as if it wasn't ever there. It does take a lot of scrubbing, but it will come off, or you could white it out but that may not look so good. I also tried to turn the camera so the "monoprice" name was facing my walls outside my home, so this kinda worked, but taking the name off entirely would be better. CONS: "Monoprice" is written on the camera. Love seeing these on my home outside. This works great with my home security system. PROS: I was recently broken into. My boss suggested I install these around my outside. It worked! I had squatters and a bad situation in the vacant home next door, they left immediately once these were installed. I took the advice of not putting in the batteries also. When the cops came to check on the vacant home next door, they saw the cameras and believed that's why the squatters left. Totally worth putting these up! CONS: None at all. Just don't install batteries. Very low price. I did not put in the batteries to have it blink. NO CAMERA blinks like that. Not a big deal at all. I mounted it up with my own screws. The screws that come with it are HORRIBLE!!! They strip just by breathing on it... Soft metal or ? Used my own screws. Again, not a big deal. I have them mounted on the front and sides of my house. Looks Amazing! When I come up to the house and see them on the sides... I feel SECURE and with my real home alarm it is a great compliment and looks serious. For the price... it is perfect. I would not want a big BLOCK style as for a home... it is kinda overkill and I feel more Fake ones look like that. I bought some white wire and cut off an amount and rant it to the camera to look WIRED... it works well and looks great. I think it is a great deterent... One thing. 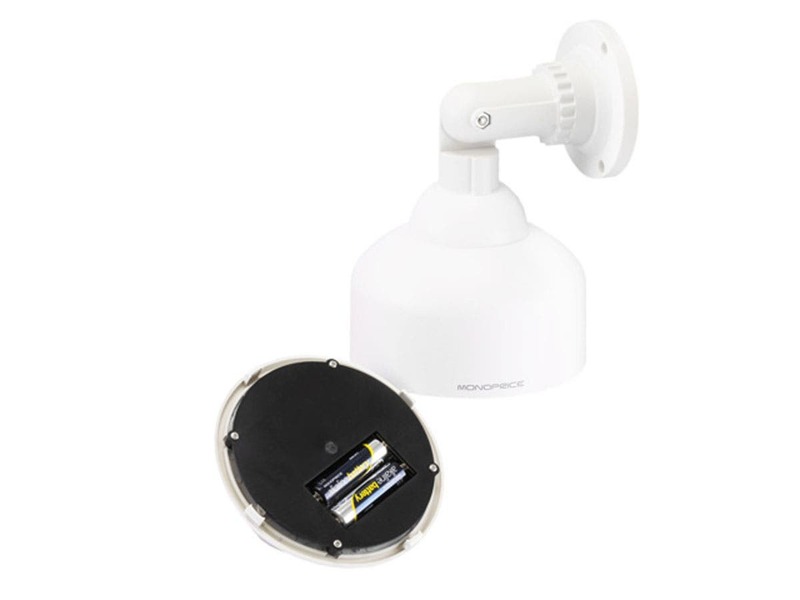 The sticker that says CCTV that it comes with... yellow sticker... it is okay but looks low end. Just my opinion on the sticker... put it up anyway. CONS: I didn't like the monoprice label on the outside... spun it around not to see it. Liked so well gave one to the in laws. CONS: Must pull out batteries to shut off. The real version of this camera doesn't flash a red light, this might be a giveaway that this is a fake. I suggest you don't use the red light. Great cam for the price.... Looks great on the side of my house. PROS: Great fake cam fooled even the fuzz. Neighbors think it's real... Looks really good up on the house. I had a cop tell my neighbor that it's one of the best cameras you could worth in the thousands, haha the jokes on them. CONS: Flashing red light.... Real cameras don't have a flashing red light, give away as a fake.